If you had a week off, you might relax. You mind unwind. 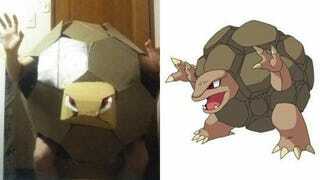 You probably wouldn’t create a Golem cosplay. Maybe you would. I’m not you. I don’t know what you think. Golem, of course, is a Pocket Monster. If you think making a Golem costume would be somewhat tricky, but certainly not too difficult, then you would be right. This week in Japan is “Golden Week,” which is sometimes abbreviated as “GW.” It’s a string of national holidays, and most of the country takes time off. Twitter user Little Getter decided to celebrate “Golem Week” and made a cosplay of the character. Then cut and put in place. Oh, we’re not finished yet! Add a head. A Golem head. There, that’s starting to look like the Pokemon. Bam! Finished. And with that, Little Getter says his Golem Week has drawn to a close.